Step 1 Preheat the oven to 180C/350F	degrees. Step 2 Grease and line a 2lb loaf tin with parchment paper (if you have a 1lb tin you could reduce the ingredients OR, bake some rolls with any left over dough). Step 3 n a bowl, add the almond flour, baking powder, salt and psyllium husk power. Mix well. In another bowl, mix the egg yolks and melted butter together (I use a whisk) Add this mixture to the dry ingredients and stir well. Add the apple cider vinegar and stir thoroughly. In another bowl, whisk the egg whites until stiff. Fold them into the bread mixture. Add the boiling water, ¼ cup at a time until you have a light dough. (You may not need all the water so add a bit at a time to prevent a soggy dough). Step 4 Bake for 30 minutes until firm. 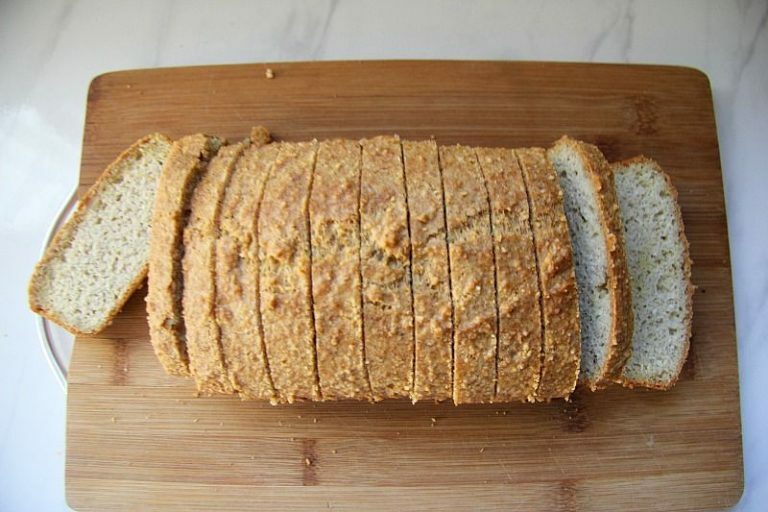 A low carb bread that is simple to make and baked with almond flour. Delicious sliced and toasted for breakfast. As with most low carb breads, the psyllium husk powder gives it more of a bread texture and takes away any “eggy” taste that some breads have. I separate the eggs and whisk up the egg white as I find it helps give the bread a less dense texture.